Snrky: He just wants us to have two hands free to type. He just wants us to have two hands free to type. I've been subjected to a lot of quotes lately. I don't want to talk about them other than to give you a Snarky. Instead, in the spirit of a very old episode of The Office, I'm going to offer you a link to a site where you can learn some management parables to share next time you're involved in some team meeting funtivities. I laughed when I read the one about the rabbit, the crow, and the fox. Snarky: Do you think when he tells us not to operate with a catcher's mitt on both hands, that he knows he's quoting Maya Angelou? 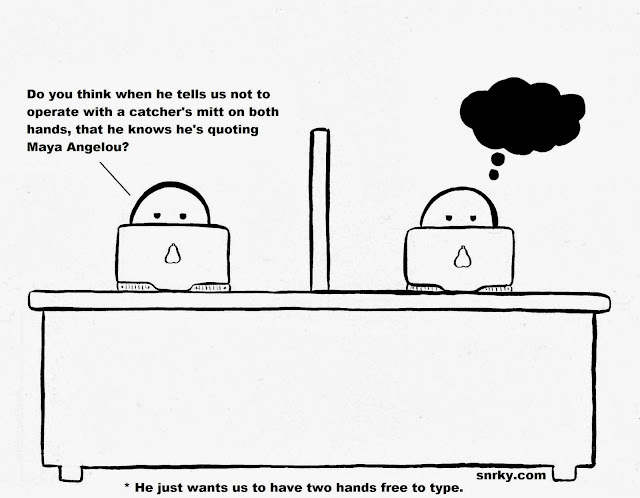 Title: He just wants us to have two hands free to type. I just know there's a better caption for this one. Perhaps something baseball related, like how you get hit in the nuts if you don't have a catcher's mitt.